I was excited to book a second guided fishing trip for Michael, Christine, and Ray from Indiana. They fished with me on Thursday and before leaving Pigeon Forge to head back home we got together for another trip on the French Broad River. The conditions on the French Broad were much diiferent today. On Thursday, TVA was running two generators at Douglas Dam and the current was moving at a good clip. Today, there was little generation at the dam and the current was perfect for fishing. It was one of those days when it seems that every species of fish in the river was on a feeding binge. By the end of the trip they had caught nearly 40 fish which included White Bass, Channel Catfish, Sauger, Longnose Gar, and Smallmouth Bass. 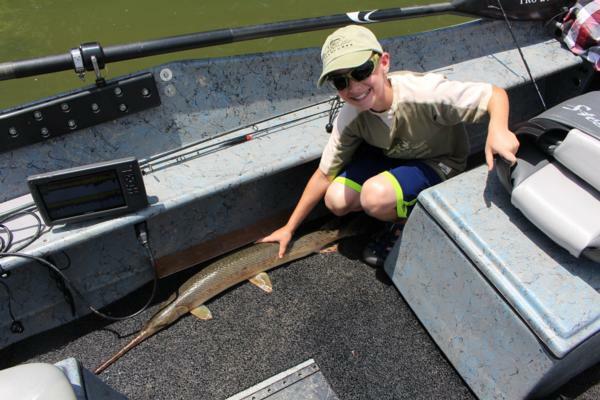 The picture in this report is a shot of Ray with a his large hard fighting Longnose Gar. I thoroughly enjoyed spending the day with Michael, Christine, and Ray. They were great people to guide and made my job easy. I hope to spend more time with them on the water in the not too distant future.